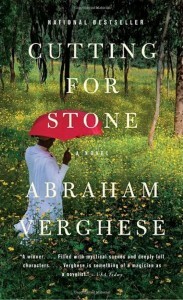 Abraham Vergehese’s Cutting for Stone is an early contender for my best read of 2010. The story spans more than 50 years and is told in first person by Marion Stone, eldest of Siamese twins, cut apart during their birth at a mission hospital in Ethiopia. Their mother, a Catholic nurse / nun, dies during the birth. Their father, a surgeon, takes off, shocked and surprised by his assistant’s labor. Their birth is then conducted by Hema, female OB/Gyn specialist, and Ghosh, a physician now turned surgeon due to Stone’s absence. Hema and Ghosh raise ShivaMarion, as the boys are known, in the midst of their country’s revolution and at the hospital where their mother is idealized and their father demonized. While both boys end up in medicine, Marion finds himself in the US and eventually crosses paths with his father who is now an expert in the field of transplantation. If last year’s favorite read The Space Between Us rose the top because of its richly layered relationships among women, then Cutting for Stone is its male counterpart. Marion and Shivas’ relationships with each other, with their two fathers and mothers – the ones who raised them and the ones who’s DNA they share – and a young girl raised as their sister, are beautifully crafted, dissected and exposed. Vergehese is a physician by trade, and while it is clearly evident in the details of the many medical events that serve as narrative milestones, it never gets in the way of a non-clinical reader. However, since I finished it, I have asked several physicians if they’ve read it. I’m eager to hear a physician’s take. Several themes in the book collide with those of my “real” job in healthcare communications. The shortage of physicians and the huge asset foreign-trained physicians are to American hospitals, the politics of wealthy health systems vs. the crash trauma centers, and risk / reward relationship of live-donor transplantation, to name just a few. As I’m processing this, I see that the overriding theme is the dichotomy of the have’s and the have not’s – whether it be a rich health system, a government funded trauma center or a charity hospital in a remote village of a third-world country. The resources at stake may be money or medicine, physicians or organs. I must not neglect to mention how much I love the title and the varied meanings it has throughout. As mentioned both in a chapter intro and in the acknowledgment, “I will not cut for stone…” is taken from the classic translation of the Hippocratic Oath. It refers to a time when physicians and surgeons were considered separate professions, and the physician vowed to not treat what would be better treated by a surgeon-specialist. I’ve seen where Cutting for Stone was at the top of many readers and reviewers favorites from 2009, and after experiencing it for myself, I understand why. This one receives my highest praise. Can I just say how much I love your blog & reviews? I can? Great. Seriously, you've opened my eyes to so many books that I possibly never would have even heard of. Yay! Thank you, Misti. That is really the nicest thing anyone could say to me. And, on for this book, I'm a true evangelist. A must read for ANYONE who ever picks up a book! I'm headed to the bookstore this afternoon. I don't normally purchase books if I can get it from the library. But, based on this review I can't wait for it to come through the system. I would imagine there is a waiting list for this one, too. I've got a copy I can send to either of you through Lisa! I reviewed this about 3 weeks ago and agree with you, I loved it. I found it could have been cheesy or sentimential towards the end but it never was. You're right, Jessica – Vergesse does a good job of resisting sentimentality at the end. And, yes Diane, I did read The Weight of Heaven & loved it (I reviewed it last month or month before…), but not quite as much as The Space Between Us. Nonetheless, she's great writer! Great review of a book I had not heard of (I am generally a couple of decades behind book releases). You make me want to read it. I will keep my eyes open for it. You said in your review that you were eager to hear a physician's take on the book…it is one of my favorite books! I did not know the author was a doctor when I started the book, but I quickly realized it could only be written by someone who had been in the trenches. I could name a medical school classmate with the exact attributes of each of the doctors in the book. This book was tragic, but it also made me laugh out loud. I highly recommend it! Welcome, Lisa. I thought this would be one that physicians would like! Interesting that you could identify the particular physician personalities portrayed. Thanks for taking the time to comment!